(reproduced from People’s Democracy with thanks). I WENT to DPRK on the invitation of the preparatory committee of the Fifth International Festival in Praise of the Great Persons of Mount Paektu who include Comrades Kim Il Sung and Kim Jong Il, from August 12-18. 241 international delegates from over 50 countries participated. What was striking was the change I saw since my last visit there some ten years ago. The agricultural situation was far better as was the tree-cover which I saw being planted during my last visit. Pyongyang had developed exponentially with an impressive sci-tech centre and street to house the personnel involved in developing DPRK’s science and technology, notably its missiles and defence technology among other projects. There was considerable effort to deal with uneven development even in the north-east of the country which I was able to visit. A balanced development is yet another achievement to be noted, as outlying areas were now being developed and Pyongyang is like any modern city in the world. Another achievement is how much effort has been spent to improve the education and development of the children, who are given utmost priority in development expenditure. Also the food situation was better. This was evident from the considerably better health of people in the streets and in the villages. Their clothes too were better than before. Institutions of education and the training of children as the citizens of the future had also progressed. But what was striking was the calm and unhurried way in which people went about their daily tasks, despite the threats the country is facing. There is remarkable unity among the people in the country, this appears to be the force behind the contempt they treat the USA with and is a result of the new confidence the Korean people have, not only by developing the infrastructure and agriculture, but also the production and provision of the necessaries of life for the people. Also, from the number of successes the DPRK has scored in strengthening and improving their military capacity for self-defence and for deterring any attempt at what the USA and its allies have been doing in countries like Afghanistan, Iraq, Libya, Syria and Yemen, there is very little fear among the people. This brings us to the present situation in which I reached the DPRK. On August 6, the UN passed resolution 2371, which the DPRK government pointed out was US imposed and “geared to completely block the… economic development and improvement of the peoples livelihood”. It further points out it had taken recourse to the development of its nuclear capacity and ICBM launches as a result of its being under a constant nuclear threat since the signing of the armistice agreement and in the interest of its security and as a deterrent to the upgrading of US threats and military exercises with its allies like Japan and South Korea. In essence, the Korean response to the US threats is clear. It says: “There are countries in which the ridiculous threats of the US are working and there are countries which lie prostrate at the bluff of the US… The DPRK has already gained everything it needed… through an arduous struggle under the harshest sanctions regime created by numerous UN sanction resolutions adopted at the instigation of the US during the last several decades.” So, on this basis it condemned the sanctions strongly saying that they are based on double standards. The DPRK will now move an action in the World Court of Justice and the US would be made to pay for its crime. If it persisted, “the US once waged a tragic war that plunged this land into a sea of blood and fire” and has continued to try and obliterate the sovereignty and ideology of the DPRK. This can only fail again as it did at the end of the Korean war. On this basis, the organisations of friendship and solidarity of different countries and international NGOs, wrote to the UN secretary general pointing out that the present situation in Korea has resulted from the partition of Korea since the last century, as part of the cold war. The US now continues its bluster and refuses to recognise its responsibility for its actions, when it should replace the armistice agreement with a peace treaty with a durable peace mechanism to implement it. The UN has failed in attempting an impartial solution. In fact, the missile testing is the genuine right of any sovereign state. Neither the UN charter nor existing resolutions of the UNGA have provisions to say that nuclear testing in itself is a “threat to world peace”. Thus it cannot be considered legal. As such, the sanctions imposed on the DPRK constitute “an aggression and the violation of the principles of the founding charter of the UN. As such they should be withdrawn as the Korean people want peace to be firmly established in their country”. We also passed a set of seven resolutions to (a) add vigour to the solidarity movement to support the Korean peoples struggle for national reunification (b) give wide publicity to DPRK’s right to safeguard its peace and security by all means possible (c) increase pressure on USA to give up its hostile policy, pull its troops and nuclear assets out of the Korean peninsula as well as war drills and arming its vassals in the area (d) mobilise international opinion against those insisting on the division of the Korea (e) expose false US propaganda against DPRK (f) worldwide actions against sanctions (g) expansion of the forces of the movement for peace in cooperation with the movements to reunify Korea and end hostility in the peninsula. So far the policy pursued by the DPRK, based on the theory of self-defence developed by Com Kim Jong Il, has been rewarded with the retreat of the USA from its unnecessary war mongering in the Korean peninsula. It is hoped that the USA having learnt its lesson in the Korean war of the 1950s will be more rational in the near future. 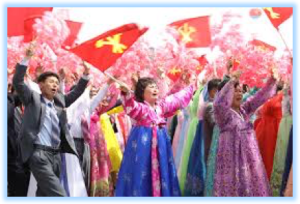 The presence of so many delegates from a wide variety of countries shows the development of a broad support base for the DPRK on the basis of its developing socialism in the framework of a policy of self-reliance and self-defence which has proved attractive to creative people all over the world. From this perspective we in India too must evolve not only campaigns to explain the truth about the DPRK but also plan concrete programmes to help a country whose independence and self respect has been punished with sanctions to hurt its people now experiencing the fruits of socialism after so many years of struggle. The festival showed how the brave always get the support they deserve.